Here at Fastrak, we strive to provide our loyal customers with the best, most hassle free experience. It is your commitment and loyalty to Fastrak that has allowed us have the great success we are so proud to have today! Everyday we are work to come up with new ideas to implement so you leave our facility with a smile on your face. Over the past two years we have created a fully functional website and interactive Facebook page so we can communicate with our customers on a daily basis. Today, we are extremely excited to present to you our new and improved mobile friendly website! 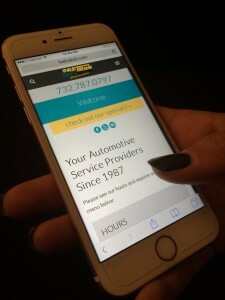 We are proud of our team here at Fastrak, who have worked countless hours around the clock to perfect this transition into the mobile device world. Our customers are always on the move and we want to give you access to our website via mobile phone to make it easier to learn about our services, promotions, coupons and more. We hope you enjoy this new feature and look forward to seeing you soon! Early November is always a little bittersweet. Halloween comes and goes, everyone brings their candy home to enjoy, it starts to get dark at 4 p.m. and the weather gets colder and damper. So what does that mean for car owners? It means that road safety becomes that much more important. There are a number of precautions that drivers across New Jersey can take once the weather begins to turn. Driver visibility is key in conditions fall/winter conditions so below is a list of 5 of the most important actions to take is to ensure that you and your passengers travel as safely as possible. – Do a full exterior light check. While seeing is extremely important while driving, it is equally important to be seen. Make sure all of your exterior lights are functioning properly. – Be aware of road conditions. Many people love to look at the piles of leaves that autumn produces, but when those leaves get wet, they can become extremely slippery and dangerous for drivers. – Check the tread on your tires. New tires can be the difference between a safe trip to your aunt’s house for Thanksgiving and a slippery, dangerous attempt to go to your aunt’s house that ends with you eating Boston Market by yourself. We know that you’d much rather be at your aunt’s house. – Ensure that your brakes are functioning properly. The ability to stop quickly is crucial in bad weather. A low brake fluid level is a sign that your brake pads are worn and should be changed. Fastrak would like to wish everybody safe travels as the holidays approach us. Do not hesitate to reach us via phone, email, social media, Morse code, Batman signals, or any other creative ways you can think of if you have any questions. On September 27, 2014, with absolutely no warning, Ian Silakowski, 27 of Atlantic Highlands, became unable to move or breathe on his own. He was rushed to Community Medical Center in Toms River, then taken by medevac to the Hospital of the University of Pennsylvania. Doctors have been working diligently to determine an exact cause of this, but unfortunately have not been able to come up with a diagnosis. 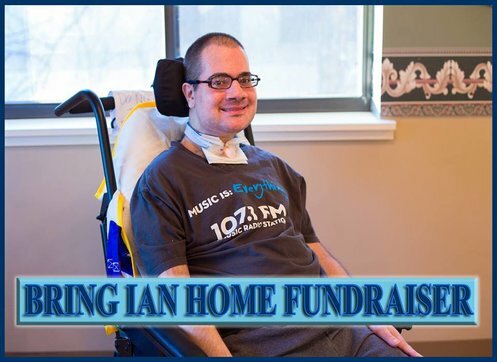 This undiagnosed condition has left Ian paralyzed from the neck down. Ian is continuing therapy and is getting closer to home, but the family’s home is not suitable for his current medical state. They will need to make adjustments that will include a new bathroom and bedroom on the 1st floor to accommodate his disabilities. HELP BRING IAN HOME! THANK YOU! WE WILL DONATE $1.00 FOR EVERY VEHICLE WE SERVICE IN THE MONTH OF APRIL. OUR GOAL IS TO RAISE $1,500! Not fair BMW! Not fair at all! Kudos to the Federal Trade Commission for leveling the playing field and enforcing a law that’s been in place since 1975. If you’re not sure what we’re talking about, we are referring to the Magnuson Moss Warranty Act, which was created to keep auto manufacturer’s from taking advantage of their consumers and to keep the playing field even. Recently the FTC ordered the MINI division of BMW to provide MINI owners with information about consumer’s rights to use third party auto services without voiding warranties. The reason for this is because MINI has been claiming that the use of any third party service will cause existing warranties to be voided. This has illegal written all over it. It is in complete violation of the Magnuson Moss Act which states that companies cannot require that consumers – in order to maintain their warranties – use specific brands of parts or specified service centers, unless the part or service is provided to the consumer without charge. It is a shame that a brand such as BMW would attempt to deceive their customers by not honoring this act. Thankfully the Auto Care Association and the FTC were on top of it. For more information about this case, click this link and if you are ever told by a manufacturer or dealer that you can only use their specific part or service, speak up and put them in their place. You have the right to choose your service provider. Do not let them dictate what you can and cannot do! General Motors LLC has issued a recall for certain Chevrolet Impala vehicles manufactured May 7, 2014 to July 28, 2014. In the event of an accident, the center storage console may not stay latched. Due to this issue, these vehicles do not comply with the requirements of Federal Motor Vehicle Safety Standard No. 201. This standard relates to occupant protection during an interior impact. If you think your vehicle may fit this criteria, contact your nearest dealer to schedule a service appointment at your earliest convenience.